John and Juliet from The Border Mill, who once again spun the yarn, very kindly took a wee detour on their holiday to personally deliver the boxes containing this latest batch. The yarns in this batch (Batch III) come from two local crofts, both of which I have talked about before and you can read more about them here (Fearniewell Croft and Orrinside Flock). I am really enjoying entering my second year of Black Isle Yarns and building relationships with the people whose sheep grow such glorious wool – visiting the same flocks at different times of year, seeing lambs grow and anticipating their fleece being available at the next clip is very rewarding. Once again Jane’s very eclectic Orrinside Flock has produced some special fleeces. Batch III includes two new yarns from this summer’s clip (and there’s more to come in Batch IV). Jane has been really enthusiastic about seeing her flock’s wool turned into yarn and I think this is influencing her choices when she’s thinking about buying new stock. Earlier this year I had an excited message telling me that she had bought a couple of Cotswold ewes and a Wensleydale tup………..and, now, here is their wool spun up as yarn! 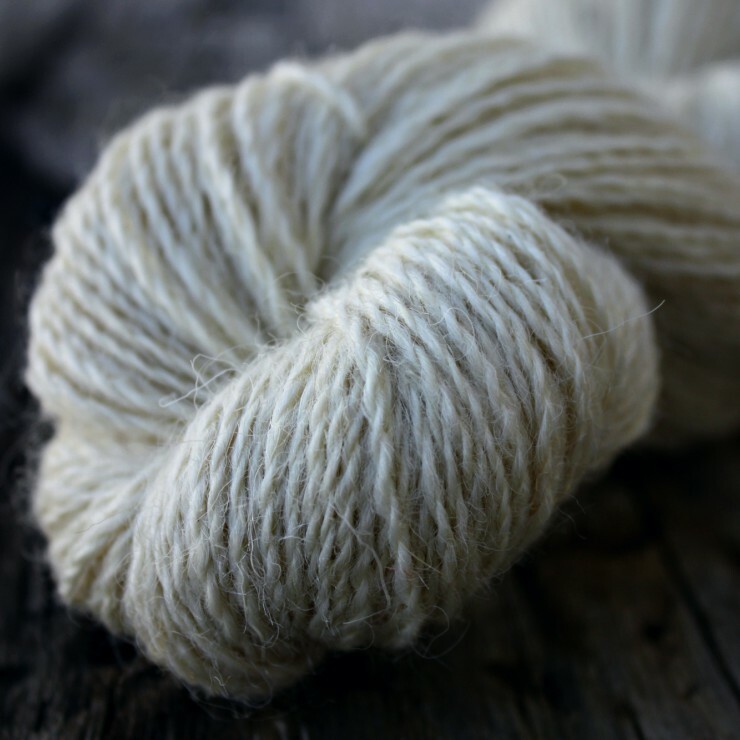 The first yarn is a beautiful longwool blend of 2/3 Cotswold and 1/3 Wensleydale – it is drapey, lustrous and has a wonderful halo (and is approximately 4 ply). I have really been enjoying dyeing with it – the colours are stunning! The next yarn is a real mix and will have to be referred to as Cross-breed Blend for simplicity. It is a blend of three cross-breed ewe fleeces – Bluefaced Leicester and Cheviot, Lincoln and Cheviot, and Lincoln and Hampshire. 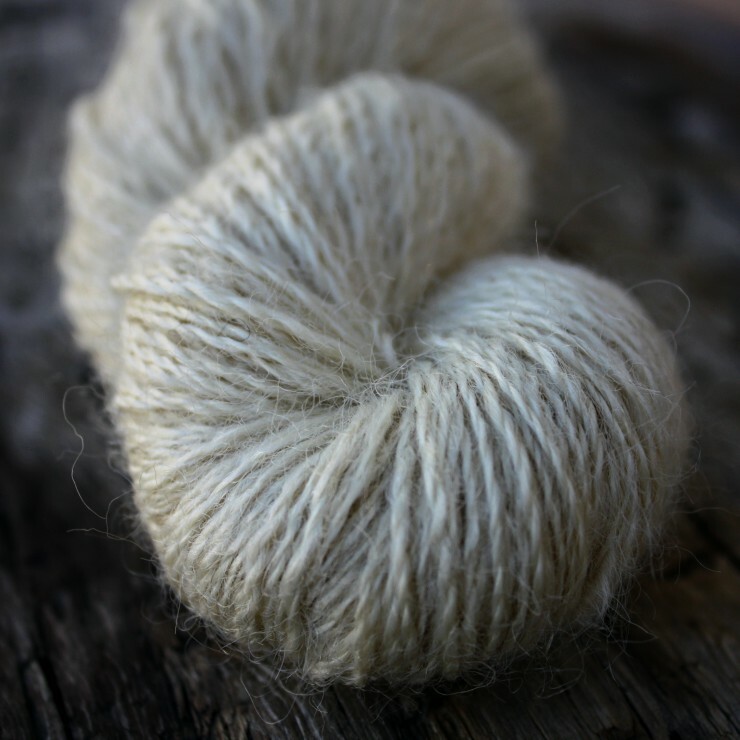 The fleeces were all lovely and I felt they would blend well together – the resulting yarn picks up drape and sheen from the longwool ancestry, softness from the Hampshire genes and a bounce and lightness from the Cheviot influence. It is approximately DK weight and is going to be so good to knit with. Dan and Rachel of Fearniewell Croft were the first people I contacted about buying wool last year. They have a lovely Gotland-ish flock (‘ish’ because have some Shetland genes and aren’t quite pure Gotland). I have been eagerly anticipating this year’s clip and I am delighted that I was able to select a few more fleeces this year, so there’s a bit more Gotland-ish available this time round. I haven’t yet wound any of it off the cones as there will be a special colour-work pattern coming soon, developed especially for this yarn. I don’t want to start winding skeins until I know how much of each shade will be required by the pattern, but it won’t all go into kits so there will also be the usual 100g skeins for your own projects. I really want to make sure that a good amount of Batch III is available online for those that can’t make it to the shows I’ll be attending this autumn………I suspect they will be snapped up pretty quickly when seen in person. I have naturally dyed a fair amount both the Longwool and Cross-breed Blends this week and am planning to have them ready in the shop by tomorrow evening at 7pm (Friday 29 September 7pm UK time). There won’t be much chance for previewing this time I’m afraid – they’re still hanging out on the line drying at the moment so I won’t be be photographing and listing in the shop until tomorrow! I’m hoping for another shop update later in October. 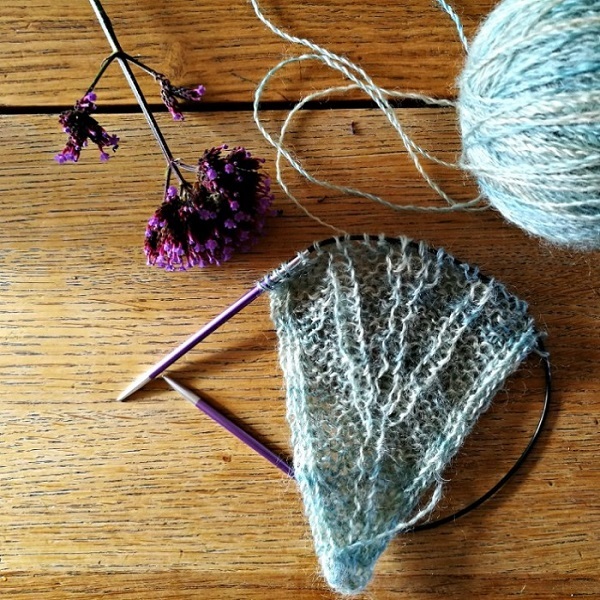 I snaffled one of the Longwool Blend skeins to knit a Lode Shawl (pattern by Clare Devine). I’m only in the early stages but am loving knitting with the wool and thoroughly enjoying the pattern. Thank you so much for your support for the naturally dyed Cheviot which went into the shop at the beginning of this month – it nearly all sold within 24 hours! 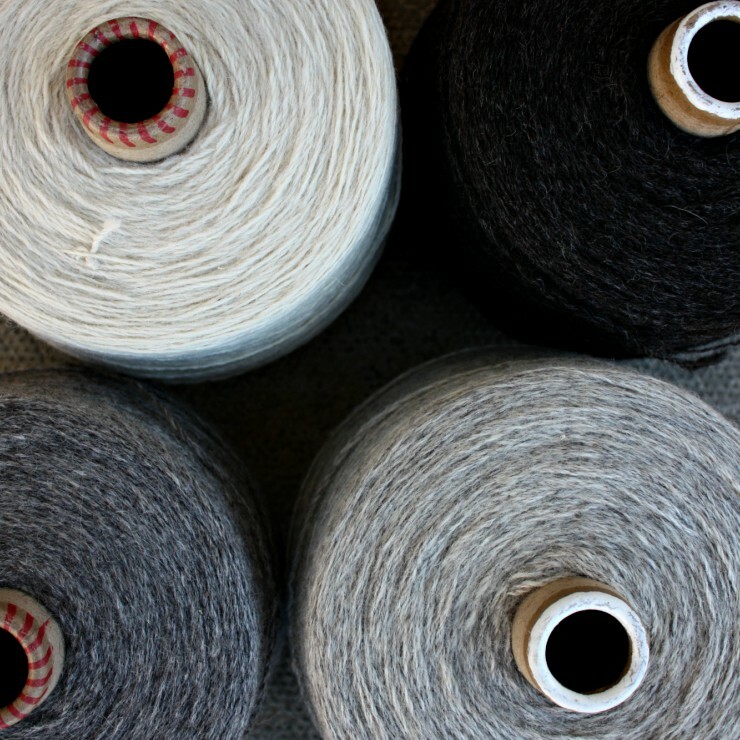 I really can’t tell you how much I appreciate your interest in Black Isle Yarns.